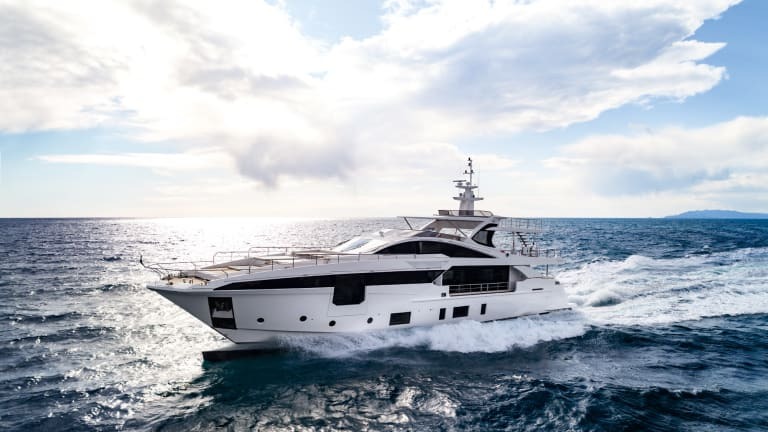 The story of Azimut&apos;s 115-foot Grande 35 Metri begins inside the builder’s research and development department, moves on to the design studio of naval architect Pierluigi Ausonio in Italy and then shifts to the thousand-foot towing tanks at the Brodarski Institut in Zagreb, Croatia. That last step is a clue that something unusual is afoot. 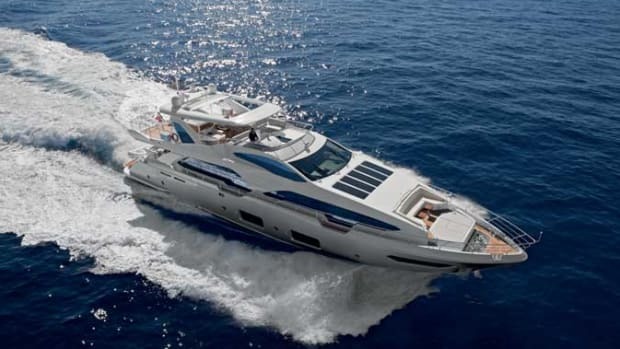 Azimut built its first production motoryacht longer than 100 feet back in 1982. For a yachtbuilder with that depth of experience to go to the trouble and expense of tank testing means the 35 Metri must be offering something new—in this case, a wave-piercing hull, like those used on fast catamaran ferries. More blade than bow, the wave-piercing design gives the 35 Metri’s hull an exceptionally fine entry that improves efficiency, while a hull waterline length of almost exactly 100 feet equates to a theoretical maximum displacement speed of 13.4 knots. Underway at that speed, she burned about 50 gallons per hour, giving her a cruising range of more than 1,100 nautical miles without having to drop back to what other builders might call a “long-distance speed” of 7 or 8 knots. 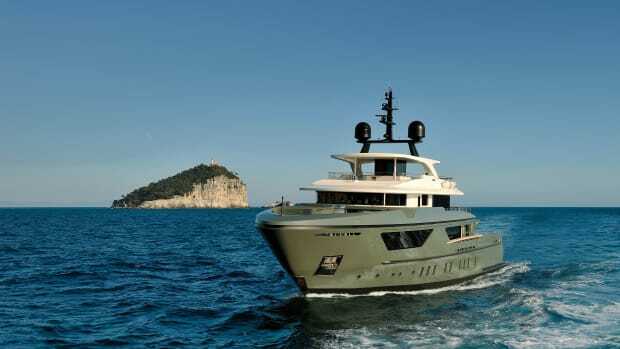 Bizzarri and his team had expected the new design to prove more efficient at displacement speeds than an older Azimut 116, but she turned out to be faster and more fuel-efficient all the way through the rev range, he says. My sea trial, lightly loaded, recorded a two-way maximum speed of 26.3 knots, and she was comfortable at all cruising speeds, from a virtually silent 10 knots up to the mid-20s. She accelerated well, taking 15 seconds to go from a standing start to 20 knots. And her soundproofing was excellent, too: I recorded 56 decibels in the wheelhouse at 21 knots. That’s quieter than background conversation in most restaurants. More blade than bow, the wave-piercing design gives the 35 Metri’s hull an exceptionally fine entry that improves efficiency, while a hull waterline length of almost exactly 100 feet equates to a theoretical maximum displacement speed of 13.4 knots. 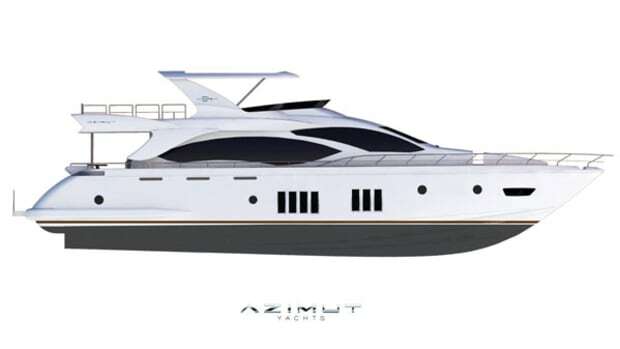 Azimut’s own comparison with its earlier and significantly lighter 116 model suggest that the 35 Metri’s hull design represents real progress. In addition to increasing the waterline length, the wave-piercing design also reduces the buoyancy of the bow, smoothing out its vertical motion in uneven seas and lessening wave impacts. With longitudinal trim changing by no more than 2 degrees between 10 and 26 knots, and a razor-sharp entry to ease the bow’s passage through the water, the yacht transitions from displacement to semi-displacement modes almost seamlessly. In the real world, this translates into comfort and cruising flexibility: Owners can select whatever speed they require, fast or slow, and the 35 Metri should slip along calmly and quietly. There is one challenge—with a positive side—related to the wave-piercing bow. 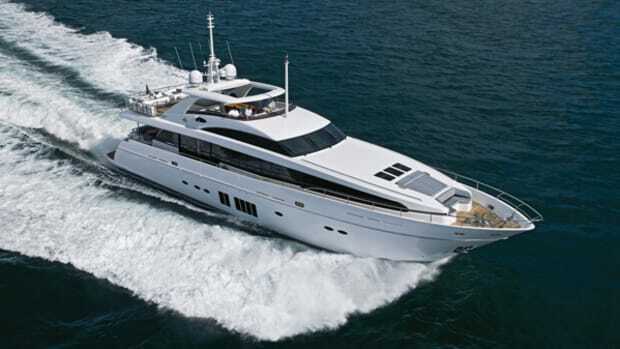 At harbor speeds, the bow acts like a keel, resisting efforts to swivel the yacht on her axis. That’s the challenge, requiring skippers used to conventional planing hulls to adapt close-quarters handling strategies. Then again, this lateral resistance also makes the bow less prone to being blown off course in crosswinds, which is arguably more of a benefit than a drawback. 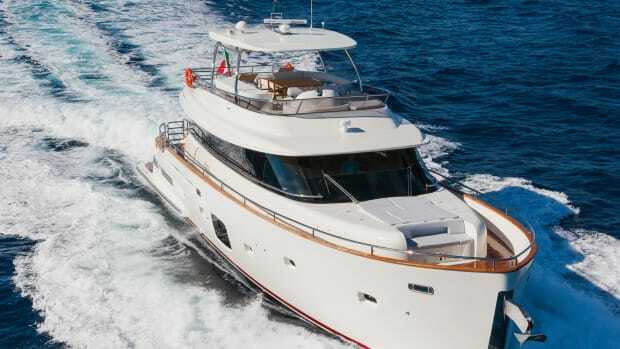 In all other ways, owners will easily recognize the 35 Metri as an Azimut creation, one with well-thought-out guest areas, construction and features. The salon offers generous glazing and a choice of Achille Salvagni interiors. There’s a main-deck master stateroom plus four guest staterooms on the lower deck, and four crew cabins. Headroom in the accommodation areas is 6 feet, 10 inches or more, and areas with sole-to-ceiling saloon windows further enhance that sense of spaciousness. In the master, the owners have a full-height window to port that folds down and out. A length of teak decking then slides out from the sole, and stainless steel guardrails hoist themselves into position, creating a private balcony. 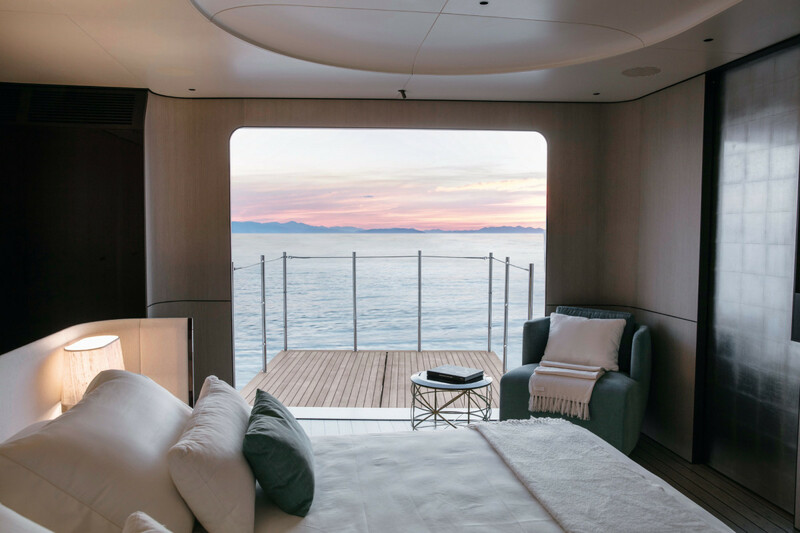 The window in the 35 Metri’s master stateroom balcony folds down, the deck slides out and the rails deploy themselves. All you do is watch. 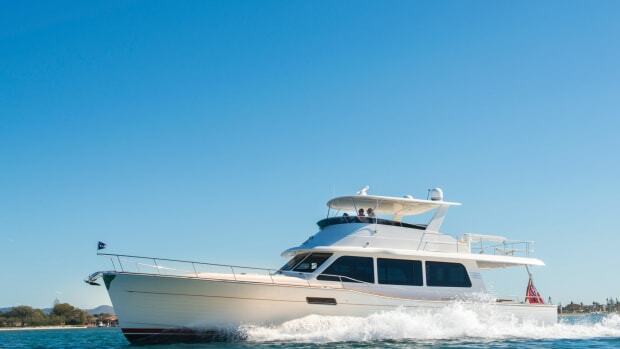 Aft, a side-entry tender garage has space for an 18-footer as well as a two-seat personal watercraft. The transom hatch drops down to create a “teak beach” for relaxing at the water’s edge. 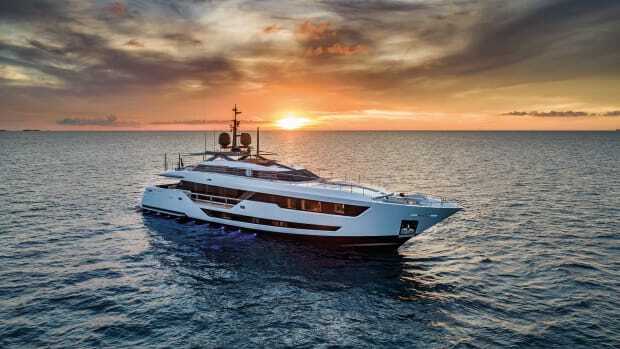 At the other end of the yacht, foredeck seating (including lounges and a hot tub) occupies more than 300 square feet, as does the optional elevated sundeck, aft. 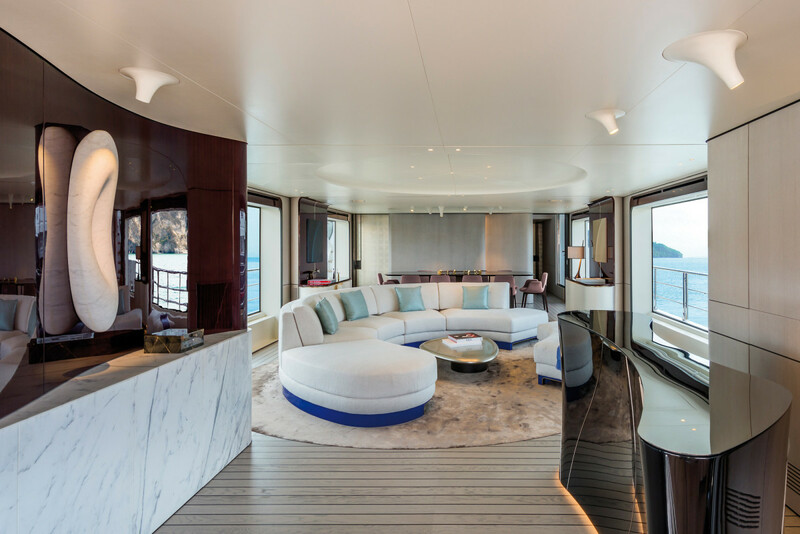 Three interior design options come from the drawing board of Achille Salvagni, while the yacht’s exterior is by Stefano Righini, whose concepts have kept Azimut and sister shipyard Benetti at the cutting edge of yacht design for the past 20 years. 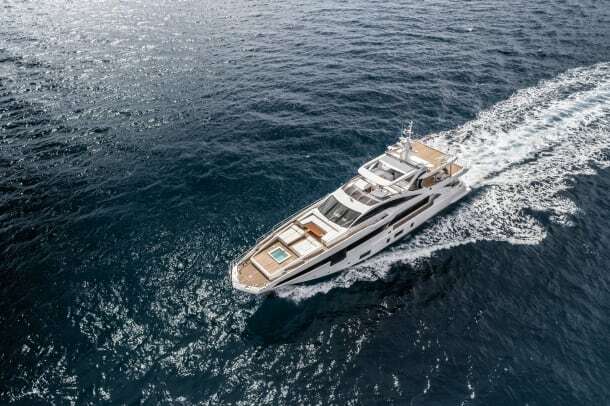 A superstructure built entirely of carbon fiber and epoxy resin, weighing just 7½ tons, hints at the technological depth in the yacht’s design. 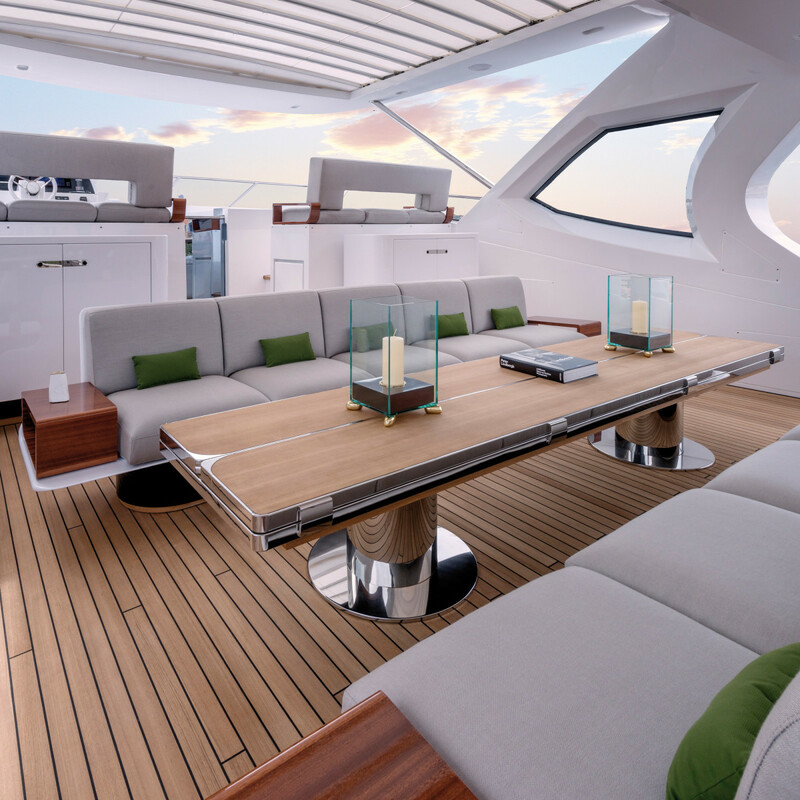 The flybridge seating exhibits integrated, wood end tables. 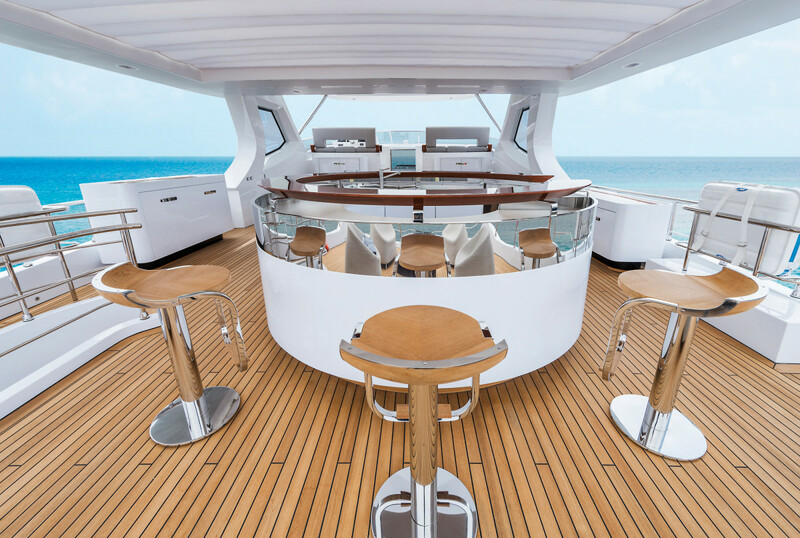 The circular flybridge bar accommodates alfresco relaxation. 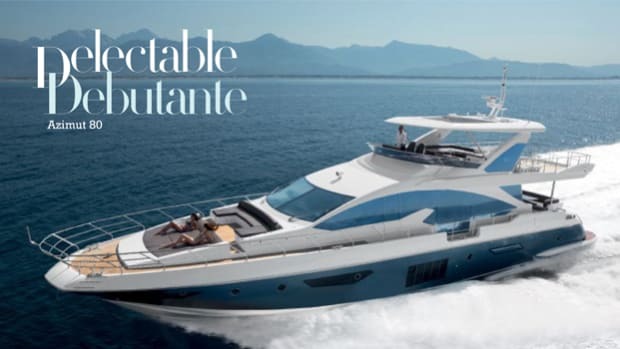 Azimut’s Grande 35 Metri is innovative in her hull design, impressively appointed and a luxurious addition to any marina. 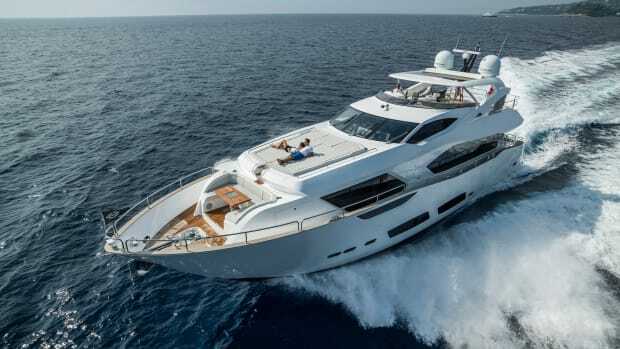 Out at sea, she really comes into her own—which is no surprise for an Azimut, but which is a surprise in terms of how she gets it done, making her worth a look even among yachtsmen who think they’ve seen it all.